SURIGAO CITY - Protesters marched towards City Hall Monday morning to demand the mayor’s intervention on the amendment of a copra trading ordinance while also asking him to act on the reported militarization of upland barangays. Nemesio Borja, chair of the Nagkahiusang Mag-uuma sa Surigao del Norte (Namasun) a and other officials handed a petition-letter asking Mayor Ernesto Matugas to act on the immediate implementation as well as infuse amendments to City Ordinance 326, series of 2011 regulating the trading of copra. They also urged the withdrawal of military troops in several upland barangays in the city. Matugas, according to city hall employees was not available because he was reportedly in Manila to attend the third State of the National Address of President Aquino. Jessa Papelleras, Namasun spokesperson, said they are asking the mayor to act on an “unfair provision” of the ordinance which cuts by as much as 30% the income of copra farmers because of the “unfair 30% deduction on moisture content” in the buying of copra. The ordinance, signed into law in November last year by Matugas, has worsened the plight of coco farmers in the province, the farmer-leader said. 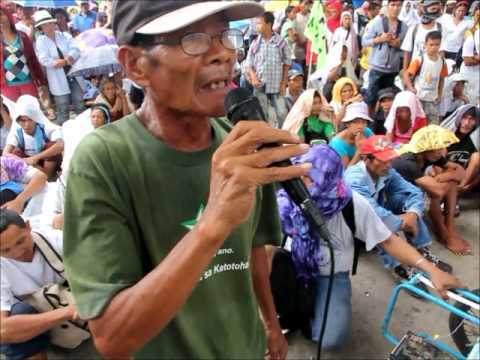 “Ang among hangyo sa mayor nga iya na kining himoan og aksyon ug mahimoan dayon og lakang ilabina nga ang mga mag-uuma ang igo kaayo niini nga provision,” (What we are asking the mayor is for him to take action especially since the coco farmers are the ones directly affected with this) Papelleras said. The group is also asking the mayor to act on a petition calling for the withdrawal of the military deployed in several upland barangay, including the contentious area where a small-scale mining activity is operating. These are barangays Mat-I, Brazil, Anomar,Poctoy, Mabini in Surigao City and several others from the municipality of SanFrancisco, Surigao del Norte. Papelleras said the military, composed of “combat troops” from the 8th IB, 58th IB, 4th ID and the 29th IB are now conducting house to house visitations, group pulong-pulongs and other activities which allegedly terrify residents. Since June this year, government troops have been deployed to barangays Mat-I, Poctoy, Mabini and Brazil purportedly to conduct Community Organizing for Peace and Development (COPD) activities. Last week, the Sangguniang Panlalawigan of Surigao del Norte called a committee hearing stemming from complaints from the Nagkahiusang Gagmay’ngMinero (Nagami) which is leading small-scale mining activities at Sitio Pinaypayan, Barangay Mat-i. A dialogue is scheduled between the military and several civilian groups and progressive organizations before the end of this month. Lt. Eugene Osias, Jr., spokesperson of the 4thInfantry Division, denied that militarization is ongoing in the area. He said the troops are there to consult with residents on the community’s problems. Osias also welcomed a dialogue with residents while issuing a challenge to the militant groups as well as others who complained of human rights violations to file a case against erring soldiers. The Aglipayan priest also lashed out at Aquino’s Executive Order 79 on mining saying there is nothing new to it except to further put the people in poverty and landlessness. “If mining indeed helps, Caraga is the mining capital in the country but majority of the people are still poor,” he said. At least 200 supporters joined the morning protest that caused a minor traffic in the city’s main thoroughfare.